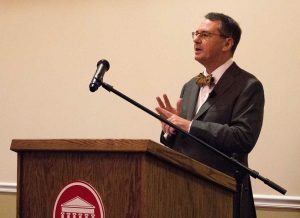 The last of four planned provost candidate open forums commenced Friday at the Inn at Ole Miss with Craig H. Kennedy presenting. Kennedy focused on moving the university forward by providing a quality education to all students, increasing diversity and retaining faculty. Kennedy currently serves as a professor in the Department of Communication Sciences and Special Education and is the dean of the College of Education at the University of Georgia. His research focuses on social relationships and aggression with autism and neurodevelopmental disabilities. He has won multiple awards, including the B.F. Skinner New Research Award from the American Psychological Association. Kennedy highlighted five areas he would want to focus on as provost: undergraduate education, graduate education, faculty, diversity and staff. Kennedy first discussed how increasing applicants can help the university grow in more ways than just sheer population. “The greater your applicant pool, the more selective you can be of your students coming to your university,” Kennedy said. One way to receive more applications is to increase need-based scholarships. Kennedy noted that providing more need-based scholarships causes the quality and quantity of the students at the university to increase. Offering a dual degree program, combining bachelor’s and masters degrees, was another plan noted in Kennedy’s speech. Through this new program, Kennedy has seen students graduate with two degrees within four or five years. Although university growth was a main topic of discussion, Kennedy stressed that growth is not the only important thing at a university. Kennedy said keeping successful faculty and staff at the university would help better the university. He said named professorships are a way to thank professors for what they have done for their school and students, while also continuing to promote education. “We, on the academic side, use the resources as recruitment opportunities … and it actually has a profound affect on the retention rate of faculty,” Kennedy said. Kennedy also touched on the topic of diversity and how Ole Miss, along with many other universities, can benefit from increased diversity around campus. “It’s about bringing out people’s talents, and bringing out people in the community that might not have otherwise participated,” Kennedy said. Some students from the university’s School of Education seem to be excited about the potential of having a provost with an extensive background in special education. Grad student Jack Burton, who is pursing a master’s in special education, said Kennedy’s education background, especially with special education, sets him apart from the other candidates. “It’s crucially important to know what’s best for a wide variety of students in a field that is constantly changing,” Burton said.